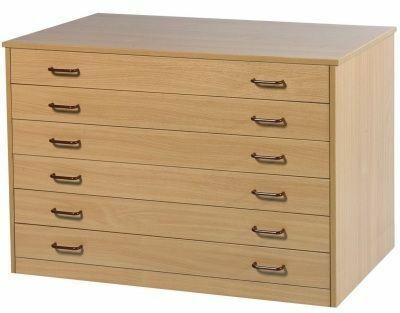 Used in schools, colleges and universities this storage plan chest is constructed from MFC, finished in Beech with six drawers to accommodate paper up to A0 size. Assembled and delivered free to mainland UK. Lead time 10 -15 working days. These plan chests are available for a free UK mainland delivery and are perfect for storing paper. Ideal for schools and finished in Beech, these storage units are delivered fully assembled and perfect for storing paper. Available with 6 drawers, these units are available within 2 weeks from order.